We are delighted and humbled for receiving this Award of Excellence from Wine Spectator, being in the company of some of the finest restaurants around the world. 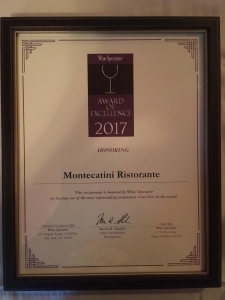 Please click here: https://restaurants.winespectator.com/…/montecatini-ristora… or Wine Spectator August 31, 2017 and August 31, 2018 Issues. Our philosophy at Montecatini is to provide authentic Italian cuisine, amazing service, and superb wines and cocktails that would bring joy to everyone, whether for a family on a budget or a foodie on a first date. Our wine list highlights Italian and Californian wines, being an Italian restaurant that is located within 2-hour driving distance of the world famous Napa and Sonoma Valleys.